Bromelain, a complex of proteolytic enzymes extracted from pineapple stems, helps promote homeostasis of prostanoid activity and supports normal physiological responses to the accumulation of immunoproteins, fibrin and cell debris in certain tissues. Bromelain is among the most extensively researched of proteolytic enzymes and is useful for supporting normal reparative activities in a variety of body tissues, but especially in soft tissues and joints. Bromelain beneficially modulates platelet function for optimal blood circulation. If taken with food, bromelain promotes healthy digestion; taken away from meals, absorptioninto the blood and resulting systemic effects predominate. 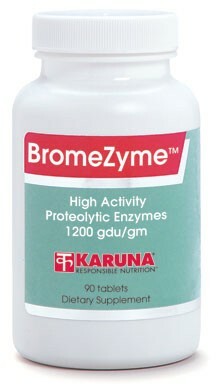 Karuna offers two potencies of bromelain for flexibility in recommending dose amounts and durations (see BromeZyme 2400™). Suggested use for adults: One tablet three times daily, or as directed.